Well 2010 has been a pretty fantabulous year, non? Who’d have thought this time last year I’d be a beauty blogger, nominated for a Cosmopolitan award, have my hair done by celebrity stylists, get to meet the global ambassadors for more brands than I can count… and eat a lot of cupcakes?! I’ve had such a fab year, and discovered many amazing new products, that I wanted to share a treat with you. 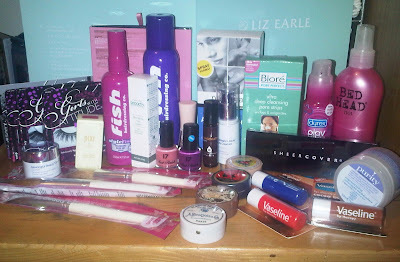 You can win all this beauty stuff, worth over £100, simply by telling me what your best beauty find of 2010 is. Pop along to facebook and become a LBQ ‘fan’, find the picture below in the album titled ‘£100 beauty giveaway’ and comment with your fave find. Simples. I’ll pick a winner at random on 1st Jan 2011 so you can start the new year with a new you. Good luck! T&Cs. The competition is open to followers of LBQ and facebook fans only. Only one entry per person. A winner will be chosen at random on 1st Jan 2011 and notified by twitter/email/facebook where appropriate; they will have 48hrs to provide an address or another winner will be chosen. Judges decision is final. You need to comment on facebook ladies – read the instructions above for more details!